The first step is to cook the breakfast sausages, and you can use whatever breakfast sausage you prefer. After cooking, place your cooked sausages on a plate with a paper towel to soak up an extra grease and set aside. Now, grab a medium bowl and mix together Lakanto pancake mix, eggs, water, and coconut oil. You can also make your own Keto pancake batter if you’d prefer. Here is my favorite Coconut Flour Pancake Batter recipe. I use the Lakanto Pancake Mix to make these sausage pancakes on a stick because it makes the recipe so easy with only a few ingredients. The pancake and waffle mix comes in a one-pound package, so you get several servings out of one bag. 1/2 cup of the mix makes 4-5 pancakes! Once everything is completely incorporated put the batter in a juice glass or regular tumbler. And set aside. Pour coconut oil (about 1 inch deep) into a skillet or frying pan over medium heat. Give the oil a few minutes to heat up. In the meantime put the sausages on the skewers. Dip the sausage skewers into the cup of batter and use the edge of the cup to scrap off excess batter until there is about 1/4 inch coating on all sides. Place battered sausage skewers in the hot oil for about 45 seconds on each side or until golden brown. While cooking them all off, I would place the finished ones on a wire rack or plate with a paper towel to get excess oil off. I like to serve them with a sugar-free syrup like Lakanto Sugar-free maple-flavored syrup. 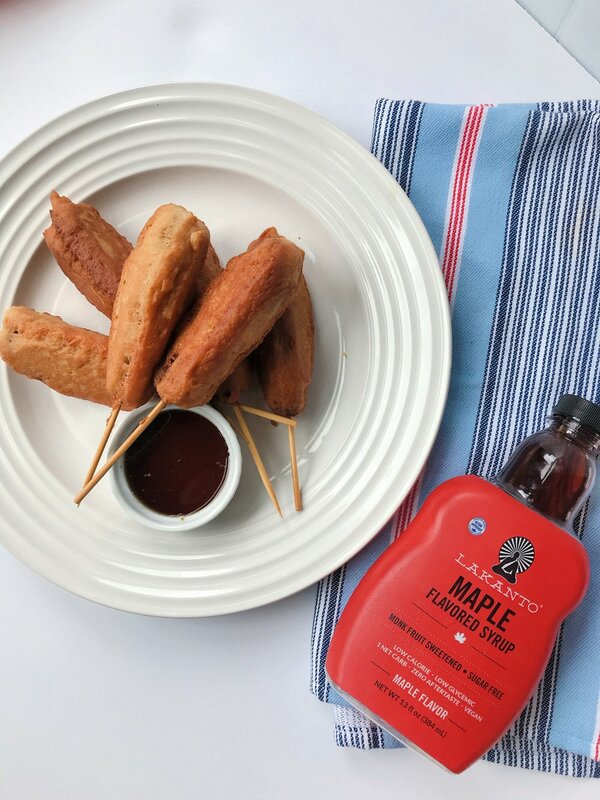 Lakanto Maple Flavored Sugar-Free Syrup is only 1 Net Carb, gluten-free and sweetened with monk fruit and Keto, Vegan and Paleo friendly! I also like Walden Farms Pancake syrup, which also has no calories, sugar or carbs; however, the ingredients list doesn’t seem as natural as Lakanto syrup. My honest opinion is if you are going for super clean and all natural go for Lakanto Maple Flavored Syrup. Still tastes great, but I prefer using it in recipes as an ingredient and for lightly dipping for recipes like this one. When I eat pancakes or waffles I like A LOT of syrup and the Lakanto tastes good, but I can tell that it isn’t real syrup, so if you are more concerned with having a sugar free, carb free syrup that tastes just like the real deal I would recommend Walden farms pancake syrup. Each sausage pancake is 118 calories, 9g fat, 5g protein, and only 2 net carbs so you could probably squeeze more than one on your keto diet menu. a medium bowl combine Lakanto pancake mix, eggs, water, and coconut oil. Once everything is completely incorporated put batter in a juice glass or regular tumbler. Once the oil is hot, dip the sausage skewers into the cup of batter. and use the edge of the cup to scrap off excess batter until there is about 1/4 inch coating on all sides.